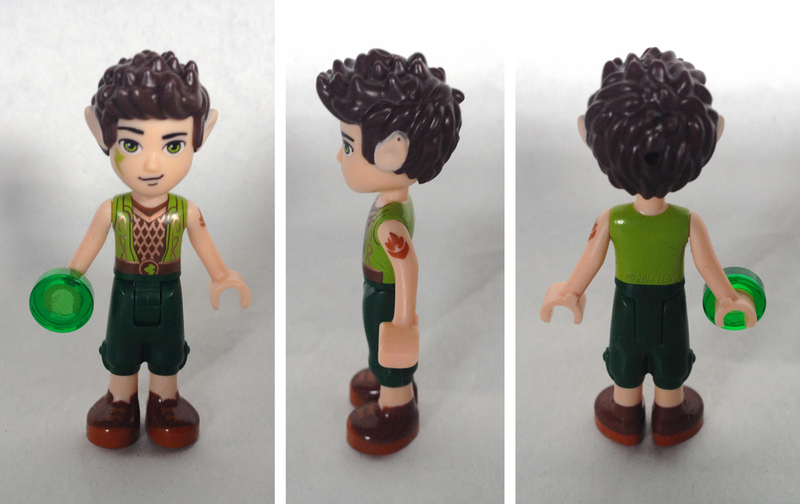 When pictures first appeared, the new 2015 theme LEGO® Elves certainly caught my attention, and the bizarre recolours were certainly a big part of that! Over the coming weeks the Barnick brothers will be examining them all - yes, today Andrew Barnick writes his first review for us. Andrew shares many of the same interests and favourite LEGO themes as his twin brother Scott (who is a regular here at New Elementary) but is also a video game aficionado; especially Nintendo. My brother Scott and I have been ridiculously excited for the new LEGO Elves theme since I first set eyes on it. I had long held a passing interest in recent sets aimed at girls such as the LEGO Friends theme, but ultimately most of that theme’s more realistic, grounded subject matter tended not to sway my purchasing decisions. Elves, on the other hand, promised an elaborate fantasy theme like my favorite themes Bionicle and Ninjago, with elementally aligned heroes and a compelling invented universe. As soon as I saw what this theme had to offer, I knew 2015 was going to be an expensive year. 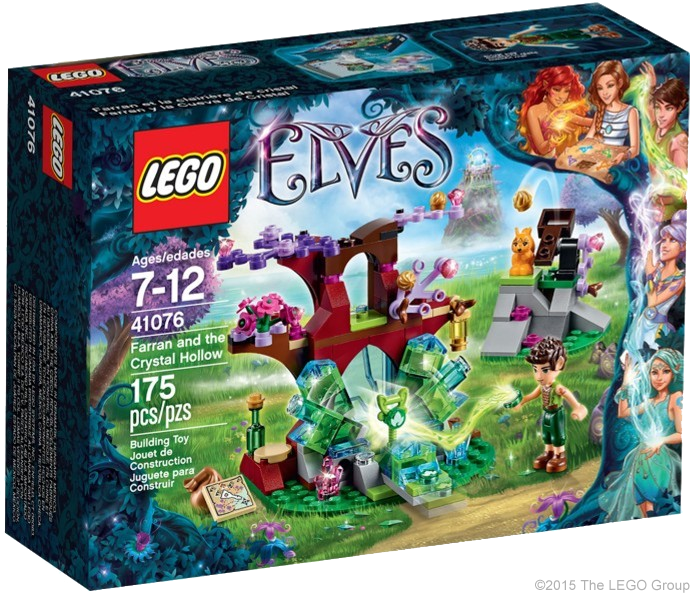 The first Elves set I obtained (which I purchased as soon as I saw it in stores) was 41076 Farran and the Crystal Hollow . At $14.99 USD/12.99 GBP, this is the second-smallest Elves set available for purchase—but it packs a huge number of interesting parts into that small package. Let’s take a look! One of the most notable new molds in this set is the Dark Green [TLG]/Green [BL] six-stemmed flower stalk (Element ID 6097232 | Design ID 19119), which only appears in this set and 41075 The Elves’ Treetop Hideaway. This element is a fantastic new part for both naturally occurring foliage and arranged bouquets, forming a much larger and fuller cluster of flowers than the traditional three-stemmed stalk. 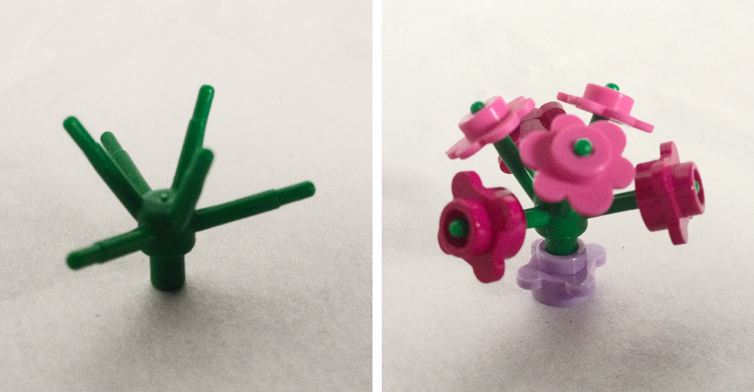 As a bonus, it attaches with a 3.2 mm bar like the bouquet from the Collectible Minifigures, allowing it to be easily held by a figure or any part with a 3.2 mm clip or hole. The most prominent recolors in this and other Elves sets would definitely be the foliage, appearing in several new shades of purple: one Medium Lilac [TLG]/Dark Purple [BL] 5x7 “large” limb element (Element ID 6097523 | Design ID 2417), and three Lavender 4x3 “small” limb elements (Element ID 6093902 | Design ID 2423). Both parts appear exclusively in Elves sets, at least for the time being, and do a great job of giving the sets an otherworldly fantasy flavor. The Trans. Medium Reddish Violet [TLG]/Trans-Dark Pink [BL] crystal piece (Element ID 6099532 | Design ID 30385) is also new and exclusive to the Elves theme. 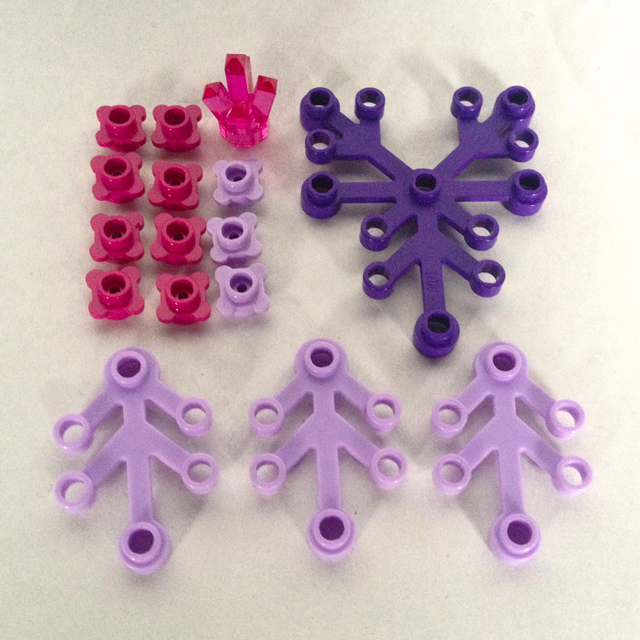 Also of note: 1x1 “flower studs” (Design ID 33291) in Bright Reddish Violet [TLG]/Magenta [BL] (Element ID 6078932) and Lavender (Element ID 6074906). The former dates back to just last year while the latter is new for 2015, and both only appear in 11 sets apiece. Other noteworthy parts in the set include five Warm Gold [TLG]/Pearl Gold [BL] 1x1 finials (Element ID 6050916| Design ID 15470). These were introduced last year and aren’t particularly rare anymore, appearing in nine other sets, but this set uses them in an extremely clever way, to be discussed later in this review. The set also features one of the new 1x1 tiles with clip (Element ID 6071259 | Design ID 15712)—again, not especially rare (and bound to become even less so in the future), but notable since while introduced last year, it seems like this year the old variety of 1x1 tiles with clip is finally being phased out completely. Also included: three Reddish Brown carrot tops (Element ID 6078605 | Design ID 33183). BrickLink also seems to list one extra, but mine either missed the weight check (justifying the inclusion of an extra) or was misplaced before I could get photos. Until this year these only appeared the 2012 Friends Advent Calendar and last year’s Rocket Raccoon polybag. This year it appears far more frequently, appearing in eight sets including this and four other Elves sets. The new and rare elements in the set aren’t limited to just detail elements, though—there are plenty of useful building elements as well! Most notable are the four Dark Red 1x3x3 arches (Element ID 6097517 | Design ID 13965). They only appear in this and 41075 The Elves’ Treetop Hideaway , which costs more than twice as much as this set but only contains half as many of these brand-new elements! Also noteworthy is the single Dark Brown 1x1x3 brick, which only appears in this set and 70016 Attack on Lake-town from the Hobbit theme. Absent since its debut in 4630 Build & Play Box way back in 2012, the Trans. 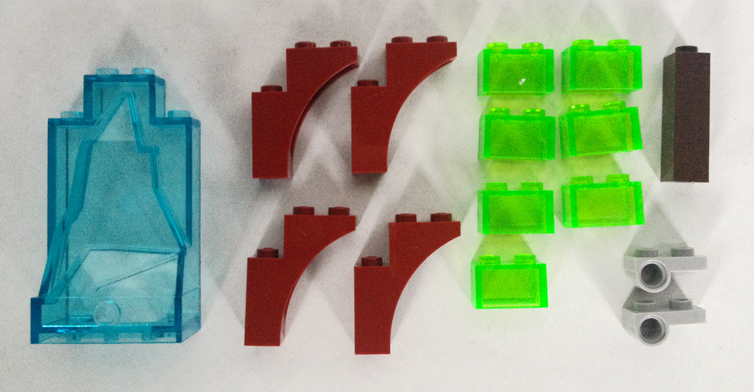 Bright Green 1x2 brick without pin (Element ID 4642409 | Design ID 3065) is coming back with a vengeance. It appears in four other sets this year, but none of them come close to the SEVEN included in this set! For those who don’t cower at the sight of BURPs, one Trans. Light Blue 2x4x6 “iceberg” panel appears in this set. 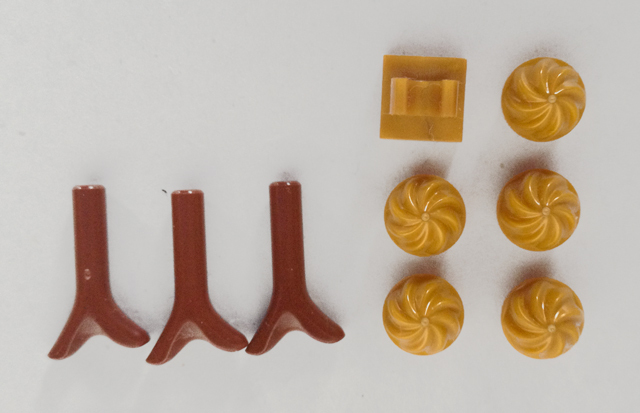 While not new, this part is only available in four other sets, and this set uses it effectively as a structural element. Last but certainly not least, this set includes two of the new 1x2 plate with Technic hole (Element ID 6089147 | Design ID 18677), previously mentioned in Ryan W.’s post about new Technic parts this past January. This part is integral to this set’s amazing and unique action feature, and being brand-new this year is definitely nice to have! Let’s finish the parts rundown with a few parts that were designed specifically for the Elves theme, but may be useful for other applications. Most interesting is the new Elven Key piece [Element ID 6097245 | Design ID 19118), which appears in four colors across this year’s Elves range (this particular set includes one in Bright Yellowish Green [TLG]/Lime [BL]). This is an interesting element for sure—it features 3.2 mm bar connections at the end and along its length, a stud on one side, and notches on the key end that allow it to securely fasten to Technic axle holes—a feature that can allow it to “activate” Technic-based functions simply by inserting the key into an axle connector and turning it. Its ornate styling will probably limit its use in some circles but could make it a useful detail element in others. Other Elves-specific parts include a printed map tile (Element ID 6104425 | Design ID 20306), which appears in several of the Elves sets, and three Trans. Green 1x1 round tiles with an elemental leaf pattern (Element ID 6104424 | Design ID 20305), which is a nice basic design and is currently exclusive to this set. Now that that’s out of the way—on to the set itself! 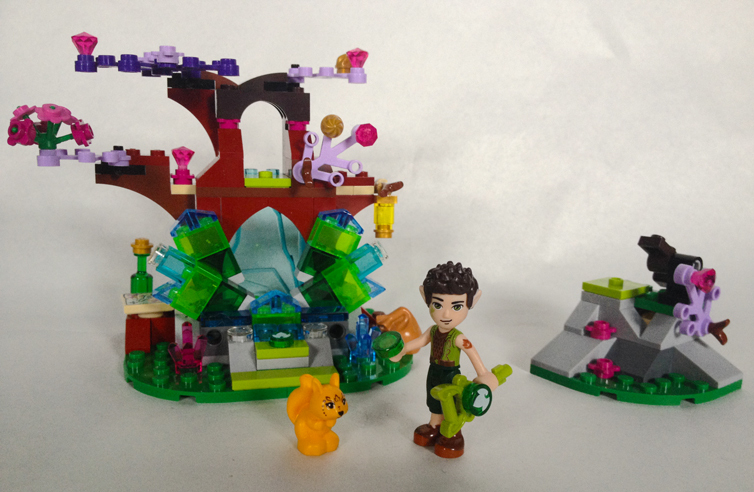 As a $15 set, the Crystal Hollow goes together quickly and easily, but is never a boring build thanks to the wide variety of colors and parts involved in its construction. The first booklet (yes, there are two, even in such a small set) instructs you to build the figures and a small rocky outcropping. Farran Leafshade, the Earth Elf, is a fantastic figure. While many people still haven’t gotten used to the less blocky and more realistic “mini-dolls”, Farran is a testament to how great these figures can look. First and foremost, Farran’s head and torso are both the slightly rare “boy” varieties. The main difference between these parts and the more common “girl” varieties are a broader, flatter chest, a slightly taller head, and somewhat humorously, a larger nose. He features elemental patterns/tattoos on his face and shoulder, which is a great detail—I was surprised to see the shoulder tattoo in particular since mini-doll arms are extremely thin, but the print is nonetheless crisp and detailed. His torso is also very detailed, with a shirt and jacket both featuring elegant metallic gold trim, but his baggy shorts and rustic footwear help to convey a casual look that would not be possible with traditional rectangular minifigure legs. All in all, Farran’s a great design—so much so that my brother Scott is considering putting together a Farran cosplay for a future convention! Farran’s tousled hairpiece with elf ears (Element ID 6107398 | Design ID 20079) is new to the Elves theme, and it’s likely to see more use by fans of castle and fantasy themes than the multicolored hair used for the female Elves. This particular color (Dark Brown with Light Nougat [TLG]/Light Flesh [BL] ears) is only used for Farran, appearing in this set and the Elves’ Treetop Hideaway, but it will also appear in Dark Orange in 41074 Azari and the Magical Bakery . Like most Friends and Disney Princess hairpieces, Farran’s hairpiece is made of a slightly rubbery plastic, and somewhat oddly has a 1.5 mm hole in the back for accessories—I say “oddly” because I can’t imagine what accessories could really suit a male character like Farran, seeing as most current compatible accessories are bows, ribbons and other feminine hair decorations, and the few that aren’t (such as the feather/flame design 64647) would look fairly odd sticking out of the back of a figure’s head horizontally). Perhaps that connection point is included to increase its usefulness as a unisex hairpiece—it could just as easily be used for a “pixie cut” on a female elf, and in that case girls might want to be able to accessorize them. Also included in this set (and exclusive to it) is the squirrel, Miss Spry. 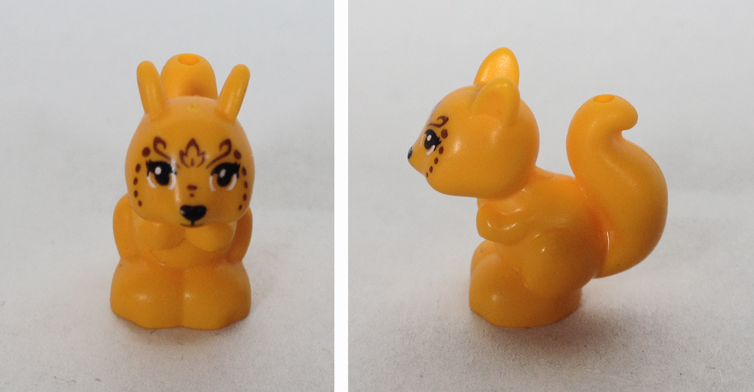 She’s different from past squirrels in the LEGO Friends theme on account of her Flame Yellowish Orange [TLG]/Bright Light Orange [BL] coat, and an ornate pattern on her face similar to Farran’s tattoos. The rocky outcropping is somewhat basic but includes enough details to remain interesting. On top is a catapult for Miss Spry to use to fling acorns (cleverly represented by the 1x1 finials) at nosy Elves, and in the back is a sliding compartment holding spare ammo (again, acorns!). Apart from that, there’s not much to say about this build—a Lavender limb piece helps to keep it from seeming too boring, but apart from providing a source of conflict play for kids, this segment is largely superfluous. Instruction booklet 2 builds the titular segment of the set: the Crystal Hollow. This part of the set is the main course, and consequently it’s got a more interesting look and features. The Crystal Hollow is composed of a tree that’s seemingly growing out of a large crystal formation. On the right of the tree is a stump where someone (assumedly Farran) has left a green bottle that we can only hope is okay for an ambiguously aged elf like him to drink. In the upper branches there’s a perch for Miss Spry to survey for intruders, and on one of the leftmost branches hangs a simple lantern (again, probably Farran’s). Finally, the aforementioned “iceberg” BURP is used to fill out the back of the tree—the LEGO Shop description calls it a waterfall, and a waterfall indeed appears in that area in the recently-aired Elves TV special, but in my personal opinion the jagged shape makes far more sense as just another crystal formation, through which the hidden Earth Key can be glimpsed. The main feature of the set is in the very center. At the base of the tree, one of the elemental 1x1 tiles indicates a secret. 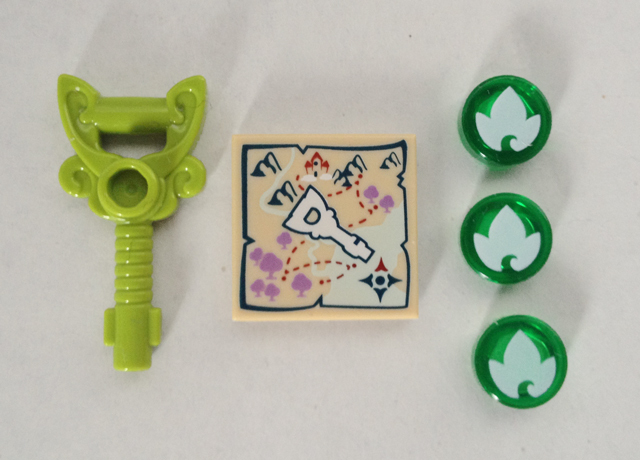 By pulling the sliding tab this tile is connected to, the crystals part to reveal the Earth Key! Despite its simplicity, this action feature feels appropriately magical, and the varied angles of the crystals in the front of the tree keep it from seeming too obvious or looking too artificial. All in all, this is a fantastic set for such a low price. Despite the many colors used for the crystals and tree, the set feels quite unified—in fact, the varied colors help it to look much more natural than a single shade of brown or red would. The conflict and action features of the set are great, and combined with the fact that the set includes the only male in the Elves theme’s main cast, I would not be surprised if this set has a lot of crossover appeal beyond the theme’s target demographic of girls ages 7–12. And for adult fans, it offers an astounding array of new, rare, interesting and unique elements. If you only get one set from the Elves theme, you could do a heck of a lot worse than this. But if this set manages to make you a fan, it might be hard to stop at just one! Keep following New Elementary for more Elves reviews from my brother and myself in the coming weeks! 41076 Farran and the Crystal Hollow is now available costing $14.99 USD/12.99 GBP. Consider using our affiliate links to buy it (or anything); this helps support New Elementary! We just bought this set two days ago after much saying "No, never!" I share your opinion: the part assortment is great and with such rare colors! And the idea of buying it came from my 7yo boy, the one that shuns over anything with minidolls: even if the Elves collection (being related to Friends) is oriented toward girls, I find it really "fable-ish" and able to appeal to boys as well. Our LUG did a 17-person draft of this set. It was glorious. I have to admit, this set is pretty darn cool. All those glorious parts... an angry squirrel... a brilliant play feature... for $15, you really can't get much better than this. I want three. "I can’t imagine what accessories could really suit a male character like Farran, seeing as most current compatible accessories are bows, ribbons and other feminine hair decorations"
Ain't nothing wrong with boys wearing bows! Oh, no doubt! But it's still far from typical—most people aren't going to spot a man accessorizing like that while going through their typical day. I was using that observation more to speculate on future use. Accessorizing the Elves would be an interesting way to keep them fresh for future waves, but I don't know what sort of accessory Farran might get—the best I could think of was a laurel wreath, which probably wouldn't have the same broad compatibility of smaller accessories. But who really knows what Lego might have planned? There are ongoing rumors about a new Fantasy-based Castle theme for the next year, over at Eurobricks. Interesting thought! I also considered that they could make great knee or elbow joints for a mech or articulated figure, since there aren't a lot of parts that include a bar with a perpendicular bar at one end (I know some mech builders have already tapped the paint roller element for this purpose, but the new key element is far sturdier). It also looks a bit like an electric guitar, but I have a weird imagination. Hello. This is completely unrelated to Elves, but I recently saw some 2015 Ultra Agents sets, and they have this weird new 1X1 brick known as an "App Brick", which has a protruding "power icon" on the side. As far as I know, this is the first element to have a design like this. Could be good for architectural details? Possibly! The app bricks have that "power icon" on one side and a regular stud on the other. I don't know how well they match other parts, though—they're a unique ABS/carbon fiber blend, so I'm not sure whether their color or reflectiveness would match standard Black parts. In any case, I'm very much considering picking up at least one set containing them before the year is up. I'm actually more interested in the app bricks' intended use of interacting with multitouch devices. Not only is it a basic design that could be used in other themes in the future (if its use in Ultra Agents proves successful), but there's also absolutely nothing stopping Lego fans from developing their own "homebrew" software designed to use app bricks, meaning that even if they do prove to be a "failure" for Lego, they can still be far from useless going forward. 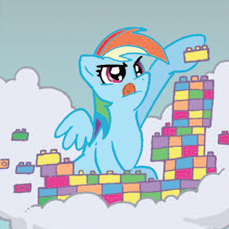 Maybe you should New Elementary should do a review of an Ultra Agents set that contains the App Bricks. Also, one of the sets I saw had an unusual contraption attached to a shooter brick and missile with string. It looked like a zipline. Now, I'm not sure how well this would work, but if it does, it could be useful in brickfilms. Maybe someone could! I still have a few Elves sets that need doing before I can even think about reviews of other themes, though—and my own personal budget is already being stretched by the amazing array of Ninjago, Elves, and Bionicle sets this year. Add in the newly announced Lego dimensions, and I'm left with the impression that neat-looking sets in themes like Ultra Agents and Legends of Chima might have to wait a few years if I ever end up getting them at all. I'm no expert on brickfilms, but I will say that the spring-loaded launcher in the set you're referring to might be a bit too hard to aim and control for most movies; if you want to actually depict a grappling hook "latching on" to a wall or the like, you might have better luck with a stop-motion solution. Okay. Thanks for listening to me.